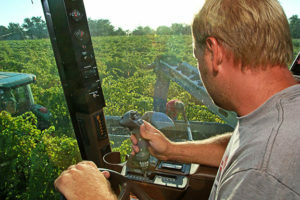 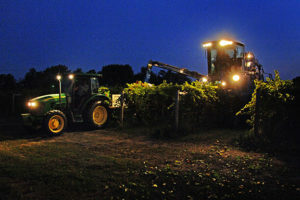 Below is a full slideshow gallery of a Tassel Ridge Wine Harvest and Crush. Click the images to view in slideshow format. 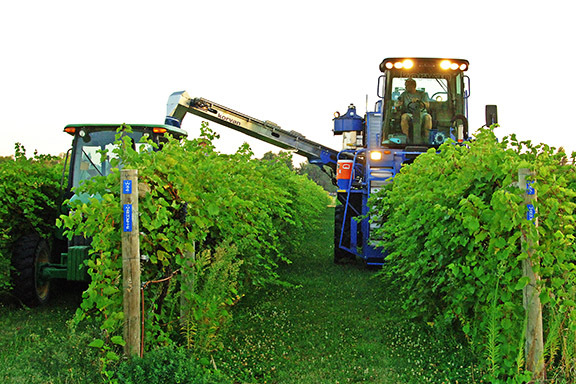 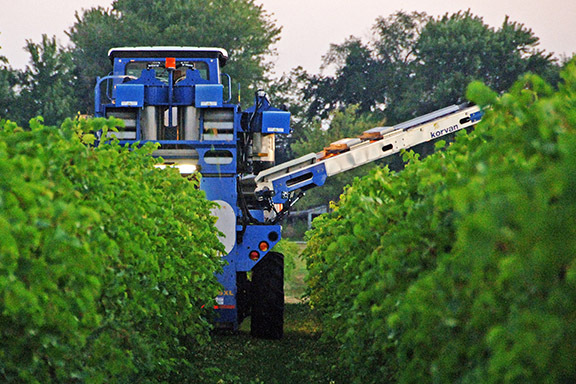 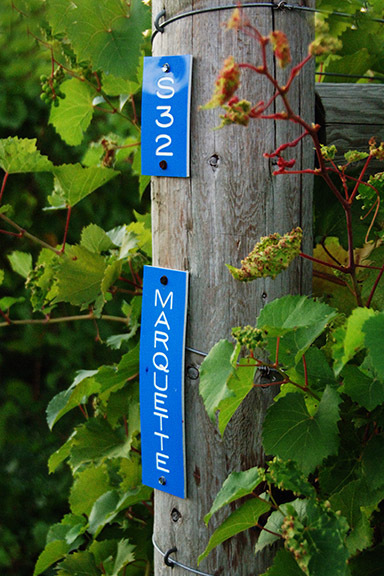 The Marquette harvest started at 2 a.m. on August 21, 2013. 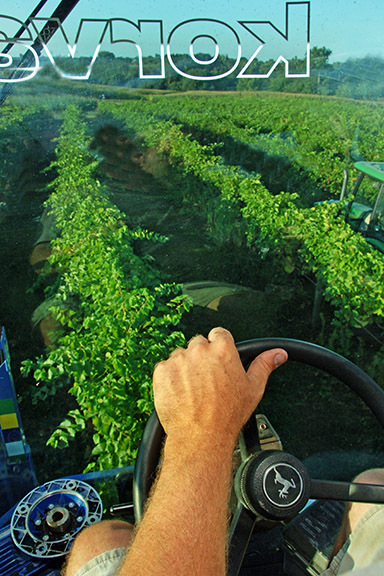 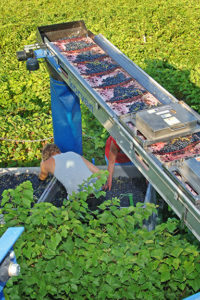 Harvested grapes are conveyed to Macrobins traveling on a cart in the next row. 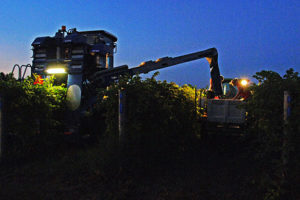 The harvester picks about 97% of the fruit. 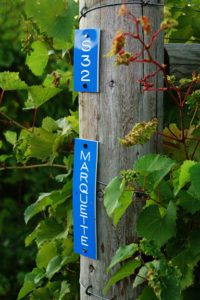 Row 32 in Meadowcreek South is planted to Marquette. Adam Nunnikhoven has to steer a straight line while keeping one eye on the trailer that is receiving grapes. 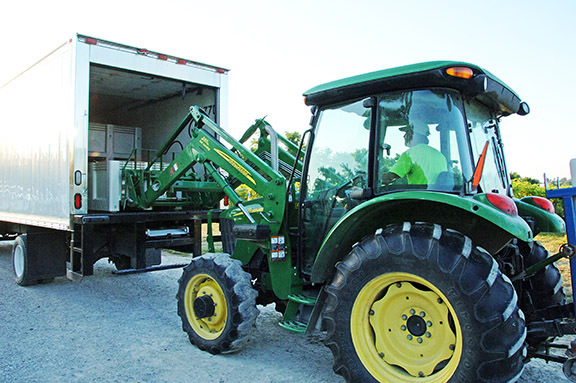 Harvested grapes are loaded into the refrigerated truck for transport to the Winery. 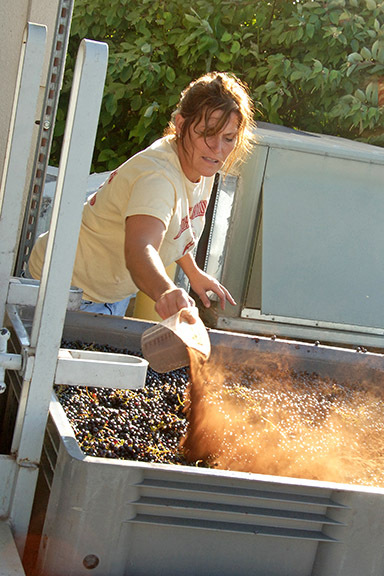 Jonita Boyer applying tannin to the just harvested fruit. 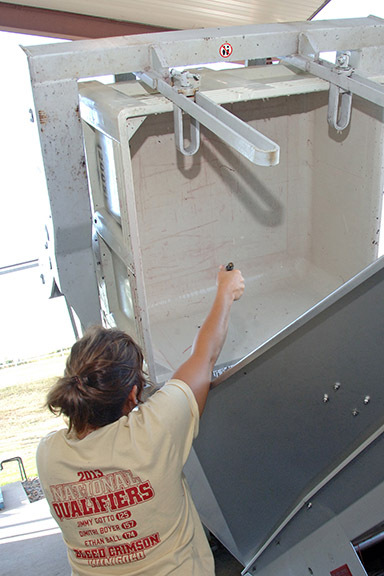 Jonita Boyer getting the last of the grapes from a Macrobin. The harvester driver has a clear view of the harvesting process. 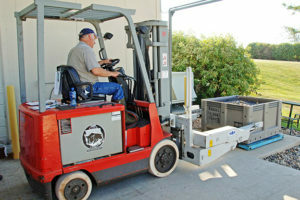 Adam Nunnikhoven controls his speed carefully to maintain the conveyor’s position above the receiving bin. Marquette grapes travel in a steady stream to the Macrobins below. 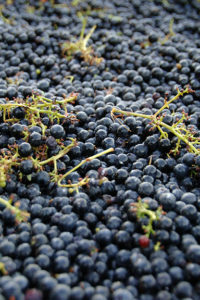 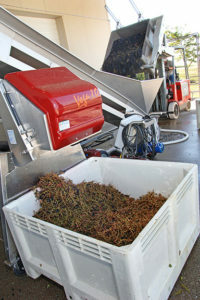 Marquette grapes in a freshly machine harvested Macrobin. 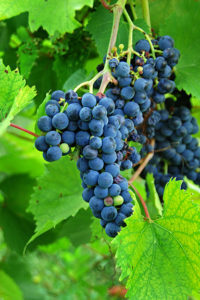 The object of our affections: a bunch of Marquette grapes. 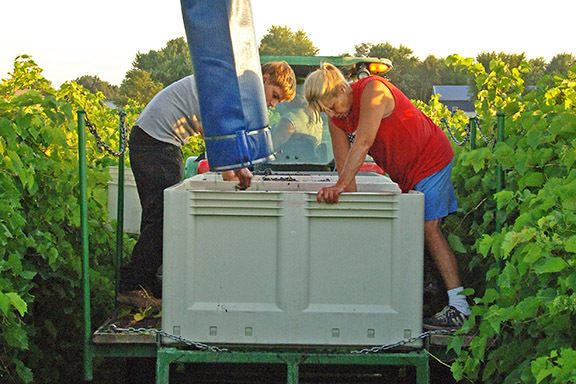 Lew Fellows weighs the Macrobin of grapes. 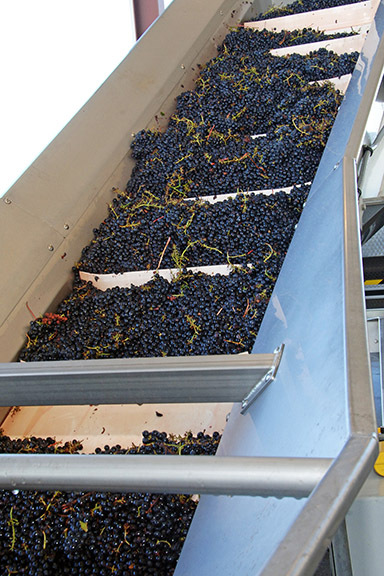 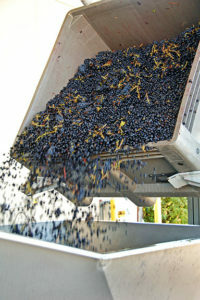 The grapes are dumped into the receiving hopper of the elevator. The elevator carries the grapes up above the destemmer-crusher. The destemmer separates the rachis from the individual grapes. 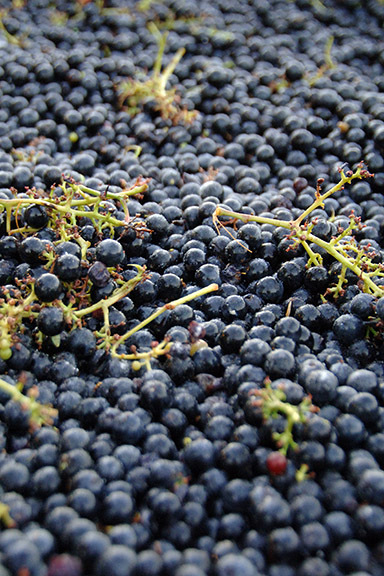 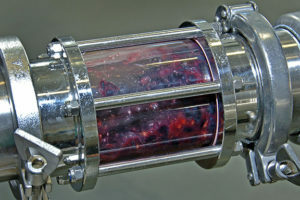 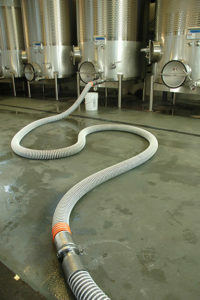 The “must” (crushed grapes, juice, skins, and seeds) is pumped into a tank.